As an art major at Livingston College, Rutgers University in the 1970s I was drawn to the work of Georges Rouault. The Biblical subjects, theme of suffering, strong color and black outlines, learned by Rouault in his early career working with stained glass, influenced my painting style. Over the years I would see if there were any Rouaults on exhibit when I visited a museum. The 2006 MOBIA exhibit “Miserere et Guerre: This Anguished World of Shadows” was very meaningful, the work itself enriched with MOBIA’s sensitive presentation. In October 2017 my family planned a week’s celebration in Paris. Diane, my wife, began to search for Rouault works we would be able to see. She came across a reference to the conserved studio in the apartment where Rouault had lived and worked, which is now the office of the Rouault Foundation (www.rouault.org). An email inquiry yielded a prompt reply politely asking why we wanted to visit, explaining that the studio was not open to the public. Diane admitted we were nothing more than the public but told of my long admiration of the artist and gave the dates we would be visiting Paris. A week before our trip M. Jean-Yves Rouault, grandson of the artist, graciously invited us to come on a Friday afternoon when he would be at the Foundation. The apartment was located in the Bastille area, only a metro stop from our hotel in the Marias. We entered a building with a caged elevator, wide red-carpeted stairs and tall paneled doors that immediately gave us the feeling of stepping back in time and most certainly stepping into a piece of history. M. Rouault reminisced about his grandfather as he led us to the studio. It was just as Georges Rouault left it in 1958 at his death. There were large work tables, canvases everywhere, paint and brushes waiting to be used. The space was a wonderful room with a high ceiling and large windows with lots of light. We enjoyed seeing photos of Georges Rouault working in the studio as well as sitting in the living room with family members. There was a large painting of Rouault’s earlier Symbolist style, which was influenced by Moreau, and even some stained glass and painted ceramics. However, regardless of other influences over the years, his work was, first of all, about his faith. Two paintings especially impressed me. One was a nativity scene hung on a living room wall. 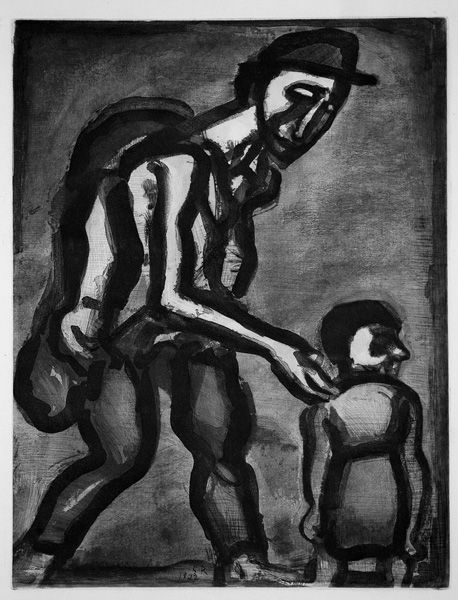 Another painting in the hallway shows a father carrying a heavy backpack with his hands on his son’s shoulders, tenderly guiding the small boy along the road. The two paintings embodied what Rouault has always conveyed to me: that in the midst of the usual, including its suffering, the beautiful and the holy are present and accessible. How appropriate that these paintings of family were hanging on the walls where Rouault both worked and lived. Everything we saw and learned reinforced my picture of a great man of faith and a great artist. The French government honored Rouault with a state funeral when he died at 87 in 1958. I and my family were grateful to have a special view of Georges Rouault’s life. I continue to seek out opportunities to see Rouault’s art. In May of this year, while visiting Charlotte, North Carolina, I was surprised and delighted to see all fifty-eight Miserere plates displayed on one large wall at the Bechtler Museum of Modern Art as part of the exhibit “Wrestling the Angel – A Century of Artists Reckoning with Religion.” It was there I realized that the painting of the father and son at Rouault’s studio was reminiscent of the wandering vagabond of Miserere plate 4 – the same heavy burden and the bent back, but also love. Jim Alimena is Vice President of Marketing at Blumberg Excelsior, Inc., headquartered in Brooklyn, NY. As an undergraduate he studied painting with Leon Golub at Livingston College, Rutgers University and has a lifelong interest in Christianity and art.